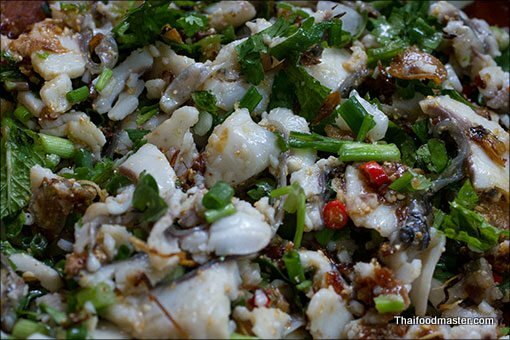 A marvelous Luang Prabang style fish salad recipe (Koi Pla), which is very easy to prepare and even though it looks simple, its flavors are complex and clever. 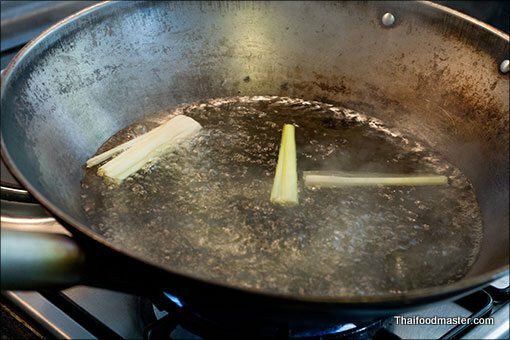 Fresh fish fillet is sliced into thin strips which are quick blanched in lemongrass infused boiling water – a cooking method that presenting it’s natural flavors with an uplifting citrusy notes. 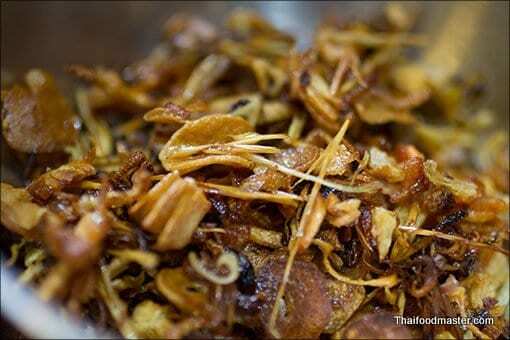 The white fish slices are then mixed with, deep golden brown caramelized mix of fried garlic, shallots and lemongrass, which are not just visually pleasing but also add a unique sweetness and richness to the dish. 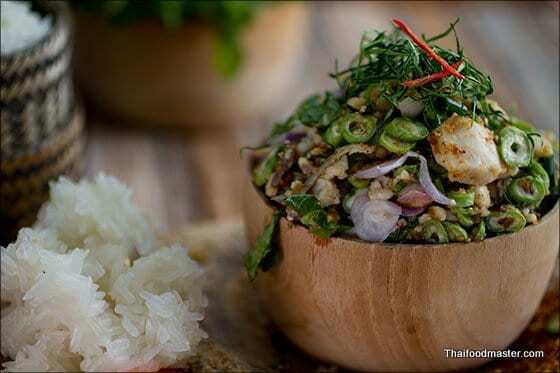 This salad is further enhanced by spicy, sour and salty dressing of fresh chopped chilies, lime juice and fish sauce, which together find a gratifying harmony with the nuttiness of ground roasted rice and the joyfulness of the fresh aromatic herbs. 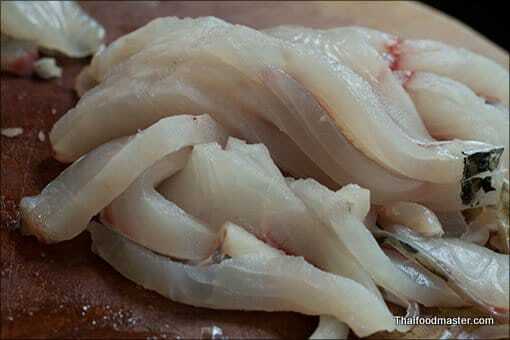 One piece of tilapia fillet, skin on about 120 - 150 g.
3 stalks of lemongrass, crushed. 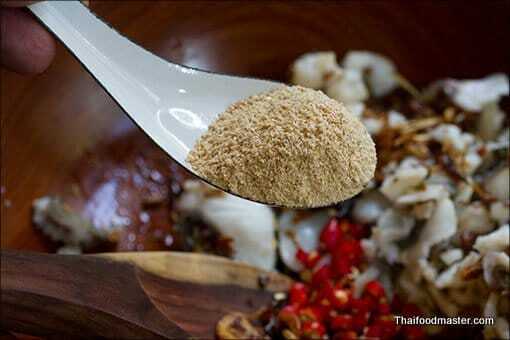 1 tablespoon roasted rice powder. 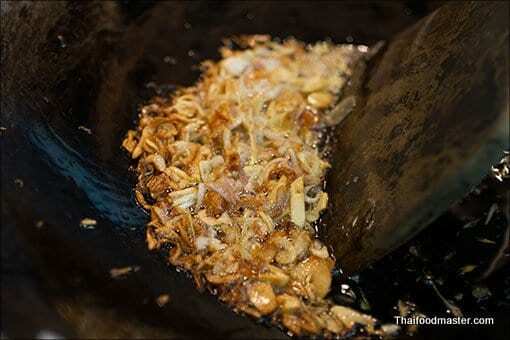 Place the wok on low heat, add oil together with the chopped garlic, shallots and the finely sliced lemon grass. 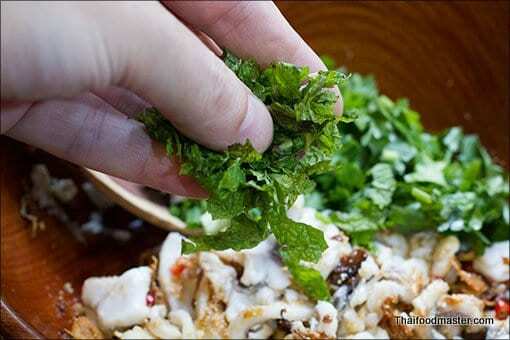 Place the fish meat on a handled strainer or a slotted spoon and blanch the fish just until almost done. In 1833 Prince Mongkut, who later became King Rama IV, found a square stone inscription, known today as “The Ramkhamheang’s Inscription”, believed to be written 541 years earlier, in 1292, by King Ramkhamheang – the third king of The Sukhothai Dynasty (1279-1298). In this inscription King Ramkhamheang tells the story of the Sukhothai regime; He includes details of the systems of law and describes how he ruled the people wisely, in a kind and personal, like father and son manner. King Ramkhamheang – (who was an outstanding warrior, statesman, scholar and diplomat who expanded his control from the Khmer kingdom of Angkor in the east, through much of what is today central and southern Thailand, to northern parts of Laos and Burma) – gives a picture of his kingdom as idyllic and free of constrains. 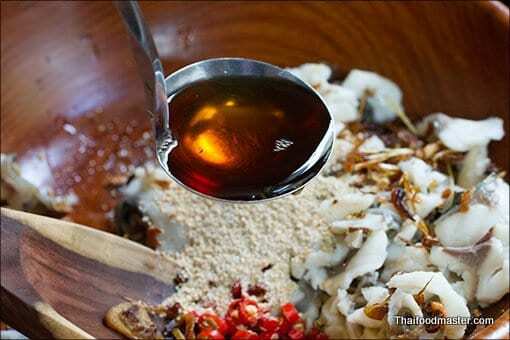 Here is a wonderful spicy Nam Tok recipe; you may as well go for it! 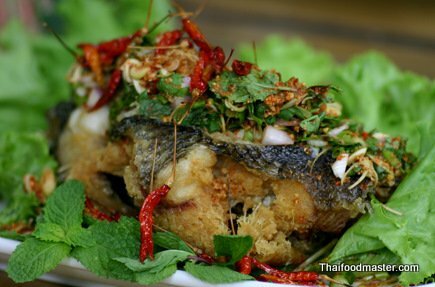 A crispy fried fish dressed with plenty of fresh herbs, plenty of chilies than some lime juice and fragrant ground roasted rice as a textural binder. It is an unpretentious dish, that is just about what is around and what is available; there is some sort of truth about it, which makes it so wonderful. 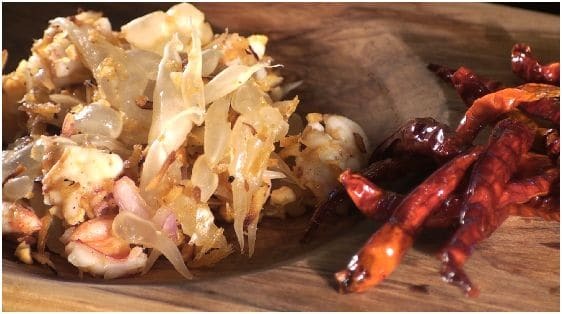 If you are trying your first Issan style recipe, than this is the one to go for. 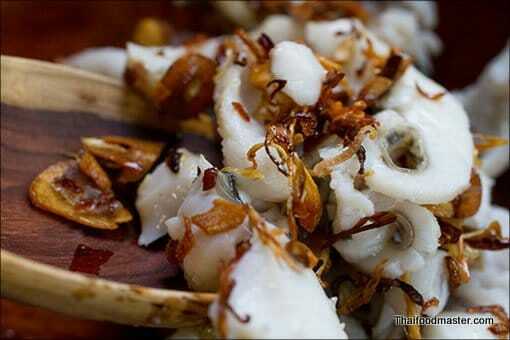 It is not complicated to prepare and will show off beautifully the hearty and rustic flavors of Issan. 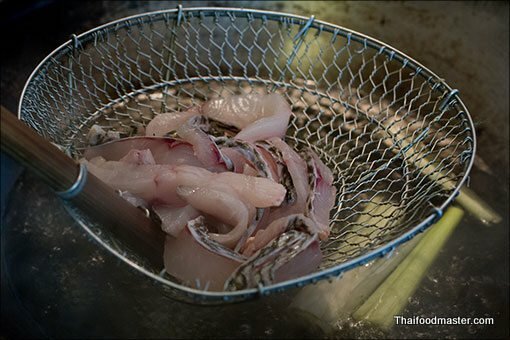 If you are a fish lover, than you know that there are only few things in life that taste better than absolutely fresh fish, deep-fried to perfection with a crispy skin that brakes open to reveal the irresistible, steamy, firm white flesh. 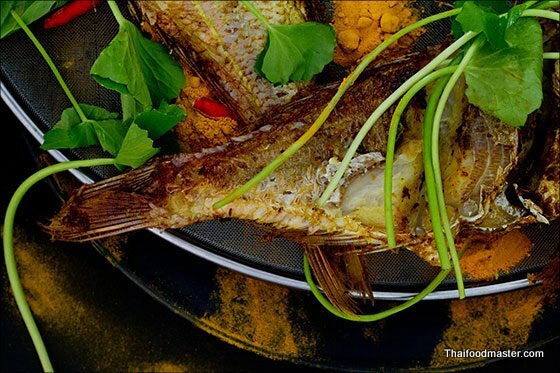 Thai fried fish recipe originated from fishing communities of the south of Thailand, were fishes are being cooked as it arrive almost directly from the fishing boats. 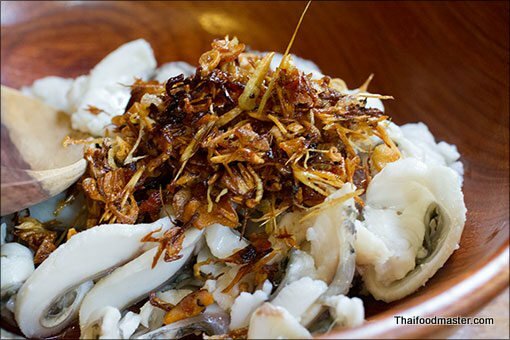 Here is a dish with a modest name that has been part of Thai culture for at least couple of hundred years. 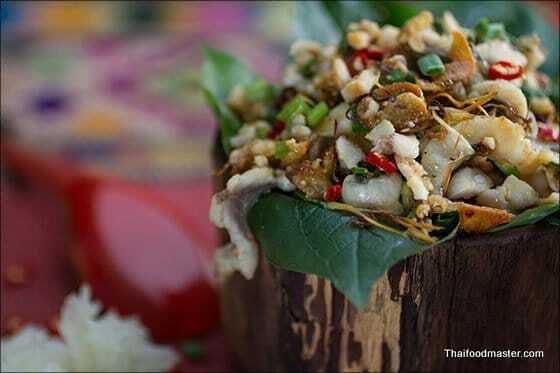 Traditionally Thai salads are divided into three main categories based on the dressing type. 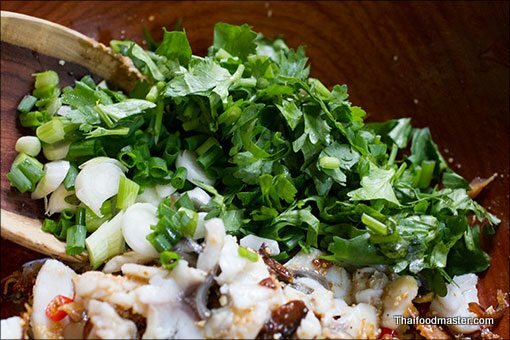 The most popular salads are those with with clear dressings made of lime juice, fish sauce, crushed chilies and a touch of sugar. 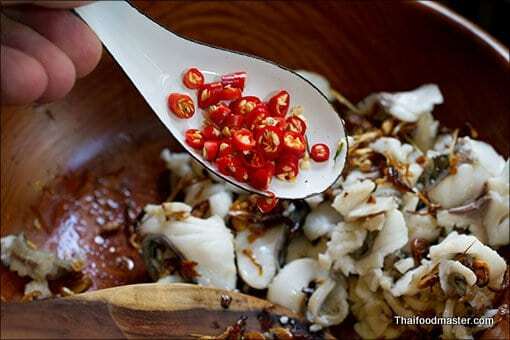 Mixing finely chopped fresh chilies including their seeds with fish sauce and a splash of lime juice makes the staple sauce accompanying almost every Thai dish. Restaurants reserve it an honor place on the table, next to the tissue paper and the tooth picks. The debate is on. Some call it “phrik naam bplaa” other will insist on “naam bplaa phrik“. 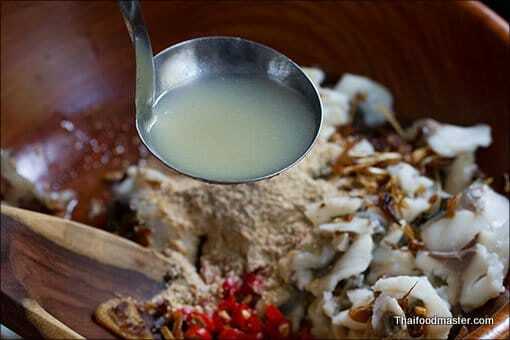 Whatever it’s called, every Thai will admit that some foods just do not taste right without it. 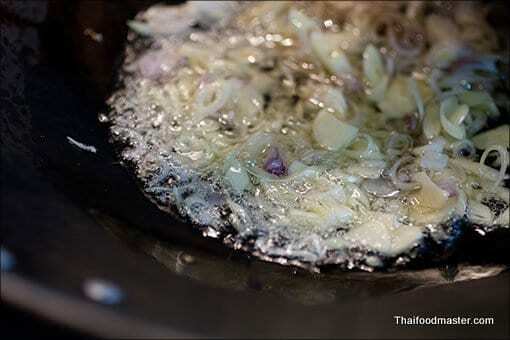 It is unimaginable having hot and crispy Thai omelette over rice without it. So, make a batch of it. 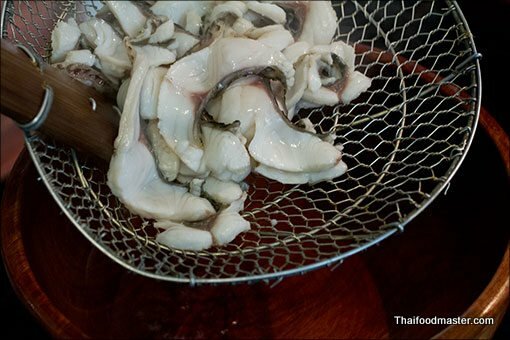 It will keep for a few weeks in the fridge and will bring you closer to Thailand as it does to the millions of Thais abroad every day. Thanks for coming back. I love your recipes. Hello Hanuman, I tried the koi pla, and it was delicious (although surprisingly difficult to prepare perfectly because the fried mixture and the fish really have to be a point). One question though: does the amount really serve 4? I used the koi pla as a starter (followed by a green curry and some cake if I remember correctly), and even though I doubled all quantities, everyone was looking a bit sad after having finished the salad rather quickly. Thank you for your work! 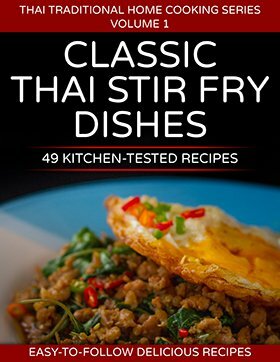 If you ever publish a cooking book, don’t forget to tell me. Hi Uwe, Thank you for the feedback and I am glad that you enjoyed the dish. 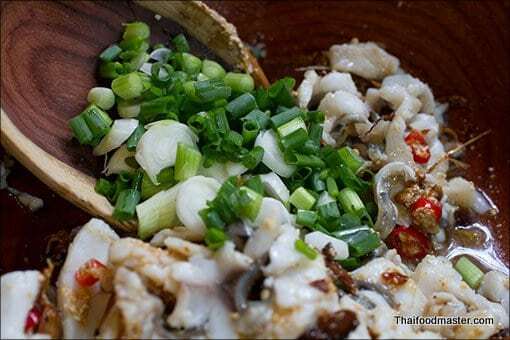 “Serving 4” should be read in the Asian context of serving few dishes to share….